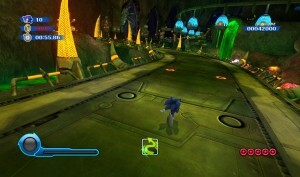 Game started development in 2011, when SEGA approached Big Red Button. Worked together with Crytek to make Cryengine 3 display the game on the Wii U gamepad while also showing it on the TV in co-op. Game is mostly two-player co-op, with sometimes four players. Evan Baily is the showrunner for the TV show. They started working on it with a somber attitude, as broader media initiatives have a poor reputation. But as they worked together with Evan they were pleased to see that he’s a gamer as well. After they got together they had no more concerns. Before really working on the games they established base rules like what the world is, what the characters are going to be like etc. 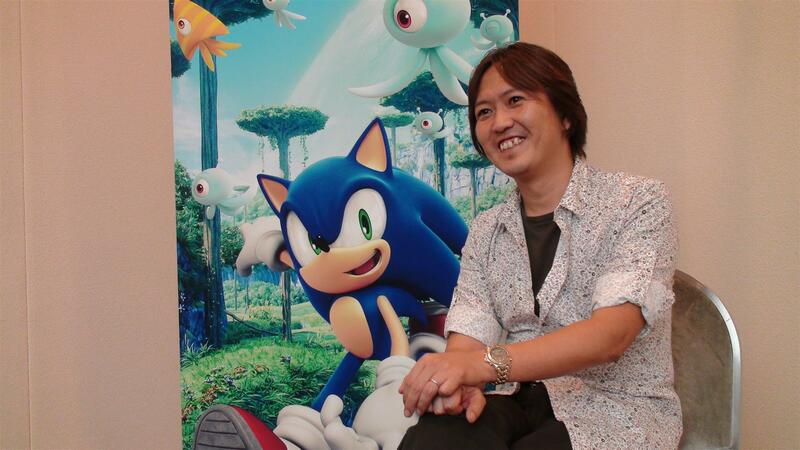 Big Red Button, SEGA and OuiDO (the animation studio producing Sonic Boom) shared ideas of what to add to both the game and cartoon. Stephen Frost (the producer of Sonic Boom) thinks they’re building a bigger Sonic world than they usually do. Stephen hopes to make more games set in the Boom world. 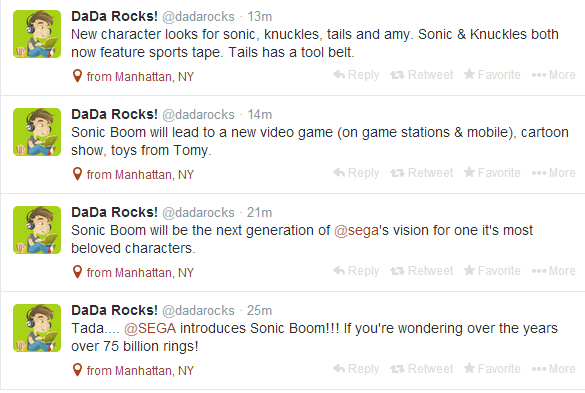 Sonic Boom won’t replace the already existent Sonic, they see it more as a branch of the franchise. 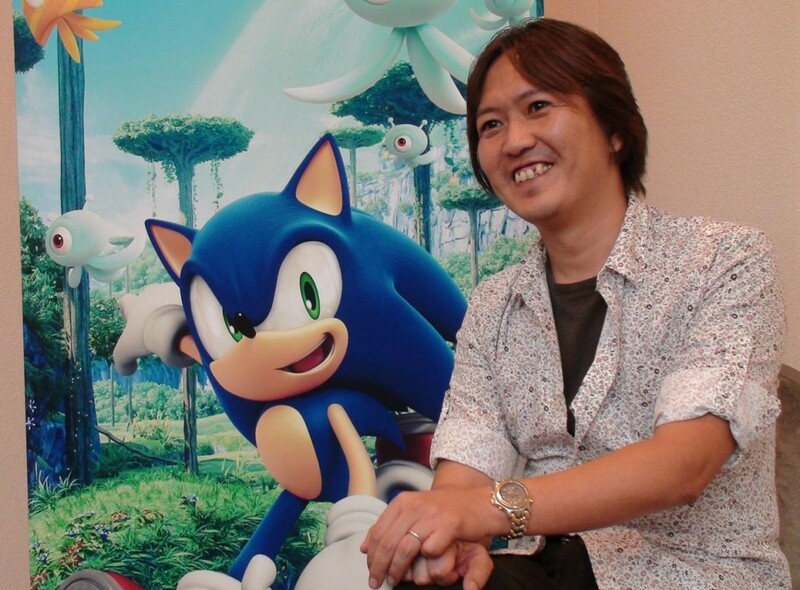 They hope to draw in new users while also trying to do something new for the Sonic franchise. They went through a lot of potential new designs for Sonic before eventually deciding on Scarf Sonic. So it seems that Sonic Boom has been in the pipeline far even before the footage shown in the CryEngine 3 showcase – that’s a lot of development time. What’s more is the gameplay details. 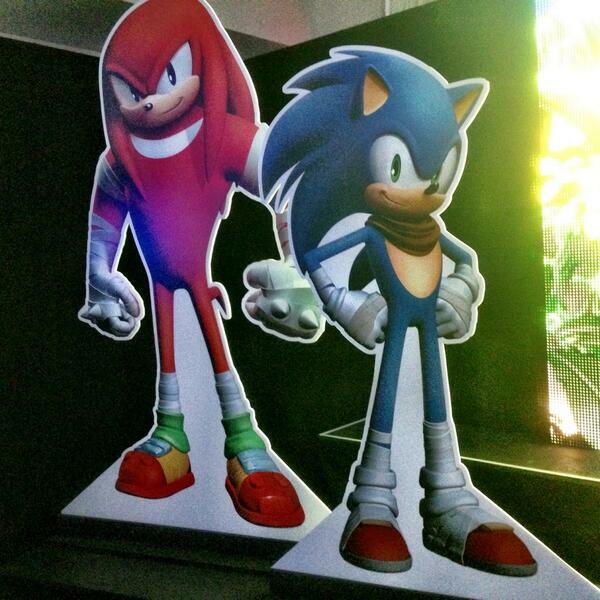 Are we looking at a Sonic Heroes hybrid type of game? The idea of having multiple characters on screen you can swap between certainly supports that idea, though we won’t know for certain until we get some clear footage of the game in motion. And that’s it! If you missed anything in this hectic week, don’t worry, we have a Sum-Up Sunday article coming with all the details you might have missed. Until then, you can check out the full interview below. Special thanks again to TimmiT of Retro for the great summary. 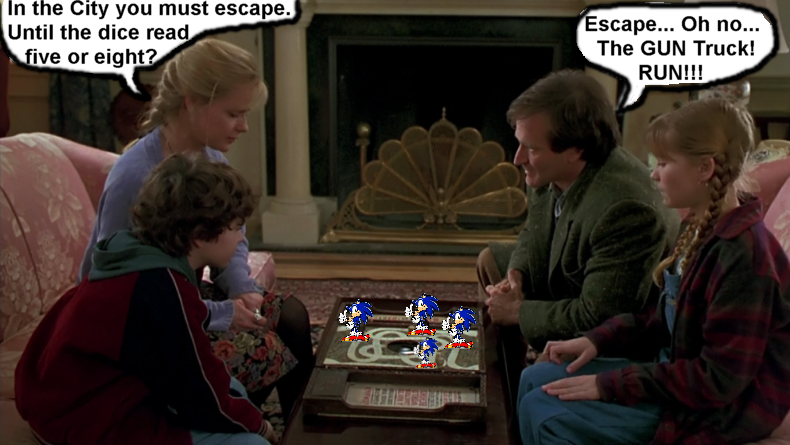 New Sonic Games Announced… Board Games that is! What do they define as ‘action games’ you might ask? Well according to the press release, this includes Pinball, Four in a Row (Connect 4), Fire Balls, Air Hockey, Rapid Fire and Magnetic Scribblers. Continue reading New Sonic Games Announced… Board Games that is! UK online retailer Zavvi.com has heavily discounted both versions of Sonic Colours after only just over a week of being on sale. Both editions are now being sold for just £17.95, though the DS version is currently out of stock (no doubt due to this offer), but the Wii version is still available as of the time of this article, so grab it while its there. In other news, another UK retailer Argos, who you may recall has been causing fans some bother since Sonic Colours‘ release day regarding an action figure pre-order gift, has answered some complaints about the gift missing from their orders. Some of our readers and members of our forum called Argos every day to try to get the issue resolved and now Argos is finally coming through by offering customers affected by this problem their long-awaited figure or a £15 gift voucher (the price Argos charges for the figure when sold separately). I called Argos today and asked about this. The attendant said the call center got an internal email about this today and checked, it said Argos had a system error and EVERYONE who preordered Colours did not get a figure (computers eh?). They apparently were trying to reach customers yesterday via email and phone. Though I had no call or email in my inbox. It’s a bit of a shame because I would kind of liked to have had the figure but eh, maybe it’ll be on ebay sometime. Well I just got a call from Argos. The person said that they can either send me the figure itself, or £15 worth of Argos vouchers. I took the figure of course! They said I should get it in 5-7 working days. Looks like they have indeed sorted it out. Hopefully they’ll get in contact with the rest of you shortly! Okay this has been resolved for me, the woman on the phone placed a reservation for the £15 Sonic figure for me and has paid it for me via Argos. I just need to go down to my local store and pick it up using my reservation number. What a hassle! Well it took 3 nights, 3 argos customer service advisors and 3 phone calls… but finally I have my figure. I got a redemption code to my email and phone. Took it into my store and got the figure. My advice… try to get a redemption code from their call centre and go pick one up in the store. I suppose it’s good if you wish to keep it in the packaging, but certainly DO NOT BUY it separately, it’s not worth it at all! 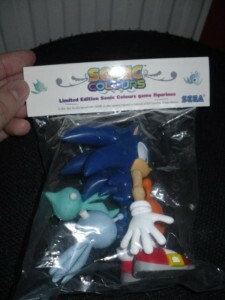 Yes this is the £15 price, it doesn’t come in a classic Jazzwares style box, it is just a ‘bagged’ figure, regardless as to if you buy colours or not. In that last sentence, Gnasher is referring to SSMB member Mahzes’ £15 purchase of the figure separately on Sonic Colours‘ launch day, which he said came in a plastic bag and not the usual packaging that retail Sonic figures are sealed in. I bought the figure in-store at Argos for £15. It doesn’t even come in a proper package, just in a clear plastic bag with a folded card strip stapled through the top. As such, the figure was (quite understandably) all mashed up, twisted and bent in the bag. Still, they’re not ‘arm going to fall off’, so I’m just sticking with it. Dunno about anyone else (or if anyone else here has even got it yet), but the joints don’t seem to allow for much movement on the figure. The arms are jointed horribly, too. Overall, the figure is just ‘okay’, but definitely not worth £15. The ‘packaging’ (if it can even be called that) is just ridiculous. If you take a look at the above picture of the figure, you’ll spot the words “Not to be sold separately” on the cardboard packaging, something we know Argos is definitely doing at £15 per figure. Clearly the figures were intended to be a pre-order gift, which Argos initially advertised them as, but come release the retailer hadn’t given them away and continued not to until nearly a week later after many pre-order customers complained, and even now they’re still selling them. 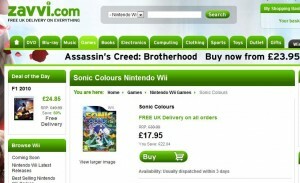 Is SEGA even seeing any profits back from the sales of this merchandise we assume the publisher gave to Argos for free? We’ll probably never know, but we do know that this has been quite the mess for Argos and their customers. 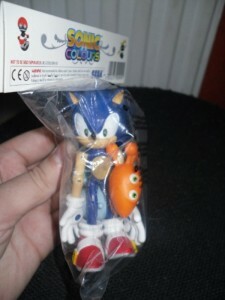 At least now the problem has been solved and Sonic fans should be getting their figure or voucher shortly. If you pre-ordered with Argos and haven’t received a call/e-mail from them, we suggest you contact the retailer and they should hopefully offer you the figure or gift voucher they’ve offered everyone in this article, but if you go for the figure, be sure to take print-outs of your order/receipt, e-mails to and from Argos about the issue and anything else of relevance, in case you experience the below situation that SSMB member Gnasher has reported in the forum. On friday I was told by the person who picked up the figure (as I couldn’t get to the store on time) what the staff tried to do. Despite having a redemption code in the form of a mobile phone text, and as an email print out. Argos staff still wanted the person to pay for the figure! Yeah, the code wasn’t a ‘free code’ it was a ‘on hold’ code. Meaning had I not made copies or my order in the form of print screens, or copied that screen shot you took of the listing, chances are I wouldn’t have gotten this figure as Argos did NOT want to give it out for free regardless of what my code said. So if you get a redemption code, take all prints and evidence that the figure it should be free with you. The game may not be out for another few weeks, but it appears that Sonic Colours is already performing very well in the sales department, because Toys R Us Canada’s website is now out of stock of the DS version of the game. We checked for the Wii edition, but their website isn’t listing it at the time of this article’s publication. The fact that the game is selling out is good news for SEGA’s sales, but for some fans it may mean having to get those pre-orders in and buy early if they’re looking to nab a copy before Christmas. Will this sales performance continue with other retailers and other countries? We’ll keep an eye open and report back. Meanwhile, share your thoughts in the comments. DualShockers has posted up a video interview with SEGA’s Dan Gallardo where they discuss the publishers first Xbox 360 Kinect title Sonic Free Riders. Nothing is revealed that we didn’t already know, but we do get some assurance that SEGA has treated this game as a full Xbox 360 title and not a quickly put together mini game title. Gallard explains, “It will be online, you’ll get the unlockables, you’ll get the characters, you’ll get the variety of environments, you’ll get everything you expect with a 360 title, all in one.” With all of the game modes, tracks, characters and features shown in the final build of the game on Gamespot’s On The Spot show, it’s no surprise that some hard work has been put into this title. Apart from the interview, you get to see plenty of new gameplay footage of the Western themed Rocky Ridge track from the Tokyo Game Show demo of the game, complete with huge jumps and minecart steering action. Thanks to Woun at the SSMB for the YouTube conversion!